For the last decade, Neon Carnival has been one of Indio's most popular afterparty destinations for Coachella revelers. In celebration of its 10th anniversary, the event, cultivated by LA nightlife expert Brent Bolthouse, has announced its expansion to Stagecoach, Coachella's country music-centric sister festival. 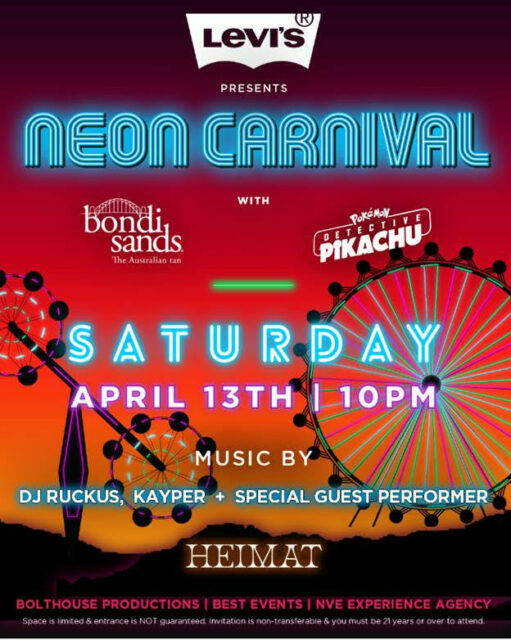 In partnership with Levi's Brand, Bondi Sands and the forthcoming Pokémon Detective Pikachu film, Neon Carnival is is set to bring its idyllic late-night desert vibes back to HITS Desert Park on April 13th and April 27th. With attractions like their branded glowing bumper car installation and an electrifying Pokémon Detective Pikachu themed Ferris Wheel courtesy of Warner Bros. Pictures and Legendary Pictures, Neon Carnival has elevated its game to new heights this year. Musical performers will include London-born house maven Kayper, Los Angeles-based beatsmith DJ Ruckus and a special guest performance. For more information on Neon Carnival, visit the website here and connect on your favorite social media platform via the links below.